Have you ever been so caught up in your writing that you sometimes resemble Smeagol, clutching your content to your chest and whispering, “My Precious”? We all have fights with insanity sometimes. However, one thing that separates the good writers from the great writers is that they are not too attached to the content they create. I know you’re probably scratching your head after you read the above sentence, but what I mean to say is the great writers are always evolving. They are willing to change pieces of their content in order to be able to write better for the reader. They sacrifice long-form sentences and dangling participles in order to craft the best article this side of Middle Earth. They have captured the true essence of fellowship with their readers and have been worthy of being crowned Lord of the Content in their market. You may be asking, how does one build up to that? Without them, your blog would be a wasteland of content that is only important to you. 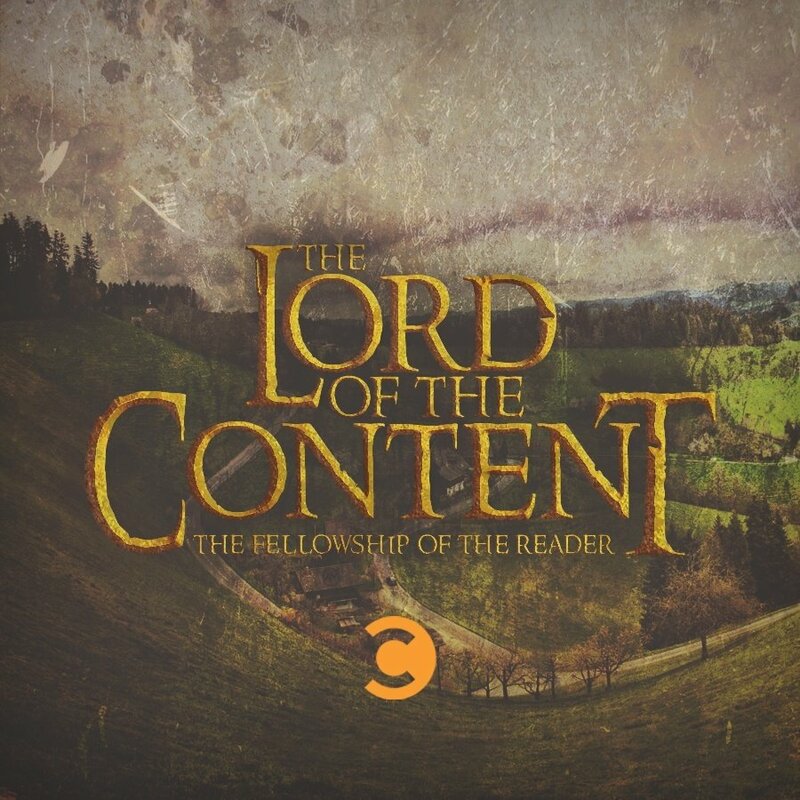 After all, without readers, your content has no one with which to build fellowship. This is why it is so important to focus on where the reader is. Learn to build your content around these people by understanding where your target market resides and what they need. You can start this process by engaging social users and through various searches on social media. Before you can begin to write effectively, you have to educate yourself on who to write for and what they’re trying to achieve. This is where a lot of content writers get lost in the mix because they haven’t learned how to survive content shock—a term coined by Mark Schaefer that explains the congestion of content and the competition that comes with it. However, if you find your reader and build a solid relationship with that reader through engagement and helpfulness, you will start to realize that content shock isn’t going to overtake your business. Thus begins the next step in the process. There’s a 90% chance that they won’t come if you create awesome content. If you aren’t out there congregating and engaging with people, how do they know to come? This is one of the most important parts of content writing, and it has nothing to do with writing that awesome piece of content. It’s about the fellowship. The engagement. The connections that you create with the readers. Sure, it’s a great thing for you to always be writing and perfecting your craft. However, you should also be in the mix every day staying visible to people and letting them get used to seeing you in their stream. The fellowship takes the most time, but this is where most of the reward lies. After all, it took five minutes to watch Frodo cast the ring into the fire and three full-length feature films before he got there. The journey to greatness is created through the fellowship with your peers and the people that look up to you. If your goal is to have the largest corporation online, and it takes you ten years to get there, you will be able to tell more stories by sharing the ups and downs throughout the journey. Understanding true fellowship leads to the path of greatness. So cast aside all of the thoughts about you. The root of your success lies inside the mind of your friends and inside the thoughts of people that want to keep company with you. Even though Frodo was the one that was supposed to bear the burden of the ring, it was the fellowship that helped him get from danger to danger in the journey. You may have the task of bearing the burden, but it is by and through the will of the people that you will make it from point A to point B. Because it’s really not about you. It’s not about me, either. It’s understanding what is good for them and creating a fulfilling relationship that compels them to trust you. When you have successfully devoted your time to the reader and what they want, you now have the means to create content that is relevant to the reader. As lord of the content, you understand the reader. You understand what the reader needs you to create. You can be lord of many or few—it doesn’t matter. The one thing that does matter is that your content is helping people. You begin and end this quest for perfect content by crafting your article around what you know about your reader. You write articles that speak to the fellowship. Pass up everything you think you should be writing about, pass up the attitude that grants you the fortitude of self-preservation, pass up the reasons why you should be doing something else, and create content for those few. Create something that will stand out to the people in your fellowship and your congregation. It is those people that are important to your brand. When you start to focus on the fellowship, you start to realize that these people will be the ones who engage the most with your content. The fellowship of the reader. Smeagol had every opportunity Frodo had to do the right thing. He lived in the same area, worked in the same location, and bore the same burden. Everything about these two Hobbits were identical. The only difference was that Frodo took the opportunity to make the right decisions with what he had. There are a lot of content writers out there that share the same opportunities. Some will take these opportunities and do great things with them. Others will hoard the value for themselves and end up alone, wondering what they did wrong. So if you realize the burden that is laid upon you and are up to the challenge, take that first step toward fellowship, and begin your journey.